Rakhshan, F., Alirezaee, M., Modirii, M., Iranmanesh, M. (2016). An Insight into the Model Structures Applied in DEA-Based Bank Branch Efficiency Measurements. Journal of Industrial and Systems Engineering, 9(2), 38-53. Fatemeh Rakhshan; Mohammad Reza Alirezaee; Maryam Mohammadzadeh Modirii; Majid Iranmanesh. "An Insight into the Model Structures Applied in DEA-Based Bank Branch Efficiency Measurements". 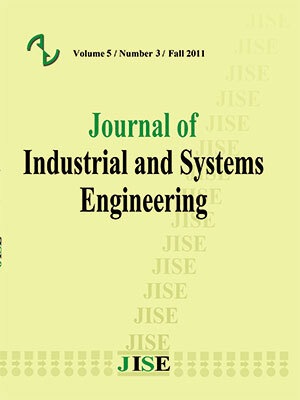 Journal of Industrial and Systems Engineering, 9, 2, 2016, 38-53. Rakhshan, F., Alirezaee, M., Modirii, M., Iranmanesh, M. (2016). 'An Insight into the Model Structures Applied in DEA-Based Bank Branch Efficiency Measurements', Journal of Industrial and Systems Engineering, 9(2), pp. 38-53. Rakhshan, F., Alirezaee, M., Modirii, M., Iranmanesh, M. An Insight into the Model Structures Applied in DEA-Based Bank Branch Efficiency Measurements. Journal of Industrial and Systems Engineering, 2016; 9(2): 38-53. 1Department of Mathematics, Iran University of Science & Technology, Tehran, Iran. In this paper, we focus on the Data Envelopment Analysis (DEA)-based model structures have been used in assessing bank branch efficiency. Probing the methodologies of 75 published studies at the branch level since 1985 to early 2015, we found that these models can be divided into four categories: standard basic DEA models, single level and multi-level models, enriched (hybrid) models and special models. Also, summary statistics for DEA applications in bank branches from the perspectives of different measurement approaches adopted by researchers and the frequency of appearing the models of each category in the literature of discussion are derived and presented. The illustrated statistical comparisons show that the popularity of multi-level models than the single level models are on the rise. Furthermore, as a result, we can conclude that from the perspective of performance measurement approaches applied to bank branches, the production approach is more widely used than the others. Ahn, H. & Le, M. H., (2014). An insight into the specification of the input-output set for DEA-based bank branch efficiency measurement. Management Review Quarterly, 64, 3-37. Angiz, M. Z., Mustafa, A., & Emrouznejad, A., (2010). Ranking efficient decision making units in data envelopment analysis using fuzzy concept. Computers & Industrialized Engineering, 59, 712-719. Athanassopoulos, A. D., (1998). Nonparametric frontier models for assessing the market and cost efficiency of large-scale bank branch networks. Journal of Money, Credit, and Banking, 30, 172-192. Avkiran, N. K., (2009). Opening the black box of efficiency analysis: an illustration with UAE banks. Omega, 37, 930-941. Azizi, h., & Ajirlu, S. F., (2010). Measurement of overall performances of decision-making units using ideal and anti-ideal decision-making units. Computers and Industrial Engineering, 59, 411-418. Banker, R. D., Charnes, A., & Cooper, W. W., (1984). Some models for estimating technical and scale inefficiencies in data envelopment analysis. Management Science, 30, 1078-1092. Berger, A. N., (2007). International comparisons of banking efficiency, financial markets. Institutions and Instruments, 16, 119-144. Berger, A. N., & Humphrey, D. B., (1997). Efficiency of financial institutions: International survey and directions for future research. European Journal of Operational Research, 98, 175-212. Boussofiane, A., Dyson, R. G., & Thanassoulis, E., (1991). Applied data envelopment analysis. European Journal of Operational Research, 52, 1-15. Camanho, A. S., & Dyson, R. G., (1999). Efficiency, size, benchmarks and targets for bank branches: An application of data envelopment analysis. Journal of the Operational Research Society, 50, 903-915. Camanho, A. S., & Dyson, R. G., (2005). Cost efficiency, production and value-added models in the analysis of bank branch performance. Journal of the Operational Research Society, 56, 483-494. Charnes, A., Cooper, W. W., & Rhodes, E., (1978). Measuring the efficiency of decision making units. European Journal of Operational Research, 2, 429-444. Charnes, A., Cooper, W. W., Golany, B., Seiford, L., & Stutz, J., (1985). Foundations of data envelopment analysis and Pareti-Koopmans empirical production functions. Journal of Econometrics, 30, 91-107. Conceição, M., Portela, A. S., & Thanassoulis, E., (2007). Comparative efficiency analysis of Portuguese bank branches. European Journal of Operational Research, 177, 1275-1288. Cook, W. D., & Hababou, M., (2001). Sales performance measurement in bank branches. Omega, 29, 299-307. Cook, W. D., Hababou, M., & Tuenter, H. J. H., (2000). multicomponent efficiency measurement and shared inputs in data envelopment analysis: an application to sales and service performance in bank branches. journal of Productivity Analysis, 14, 209-224. Cook, W. D., & Seiford, L. M., (2009). Data envelopment analysis (DEA)-Thirty years on. European Journal of Operational Research, 192, 1-17. Cook, W. D., Seiford, L. M., & Zhu, J., (2004). Models for Performance Benchmarking: Measuring the effect of e-business activities on banking performance. Omega, 32, 313-322. Cook, W. D., & Zhu, J., (2010). Context-dependent performance standards in DEA. Annals of Operations Research, 173, 163-175.
Cooper, W. W., Park, K. S., & Pastor, J. T., (1999). RAM: A range adjusted measure of inefficiency for use with additive models, and relations to other models and measures in DEA. Journal of Productivity Analysis, 11, 5-42. Dekker, D., & Post, T., (2001). A quasi-concave DEA model with an application for bank branch performance evaluation. European Journal of Operational Research, 132, 296-311. Deville, A., (2009). Branch banking network assessment using DEA: a benchmarking note. Management Accounting Research, 20, 252-261. Ebrahimnejad, A., Tavana, M., Lotfi, F., H., Shahverdi, R., & Yousefpour, M., (2014). A three-stage data envelopment analysis model with application to banking industry. Measurement, 49, 308-319. Emrouznejad, A., (2014). Advances in data envelopment analysis. Annals of Operations Research, 214, 1-4. Färe, R., Grosskopf, S., Norris, M., & Zhang, Z., (1994). Productivity growth, technical progress, and efficiency change in industrialized countries. American Economic Review, 84, 66-83. Färe, R., & Grosskopf, S., (1996). Productivity and intermediate product: a frontier approach. Economic Letters, 50, 65-70. Färe, R., Lovell, C., (1978). Measuring the technical efficiency of production. Journal of Economic Theory, 19, 150-162. Fethi, M. D., & Pasiouras, F., (2010). Assessing bank efficiency and performance with operational research and artificial intelligence techniques: A survey. European Journal of Operational research, 204, 189-198. Giokas, D. I., (1991). Bank branch operating efficiency: A comparative application of DEA and the loglinear model. Omega, 19, 549-557. Giokas, D. I., (2008). Assessing the efficiency in operations of a large Greek bank branch network adopting different economic behaviors. Economic Modeling, 25, 559-574. Green, R. H., Cook, W. D., & Doyle, J., (1997). A note on the additive data envelopment analysis model. Journal of Operational Research Society, 48, 446-448. Haag, S. E., & Jaska, P. V., (1995). Interpreting inefficiency ratings: an application of bank branch operating efficiencies. Managerial and Decision Economics, 16, 7-14. LaPlante, A. E., & Paradi, J. C., (2015). Evaluation of bank branch growth potential using data envelopment analysis. Omega, 52, 33-41. Li, Y., Chen, Y., Liang, L., & Xie, J., (2012). DEA models for extended two-stage network structures. Omega, 40, 611-618. Lotfi, F. H., Jahanshahloo, G. R., Ebrahimnejad, A., Soltanifar, M., & Mansourzadeh, S. M., (2010). Target setting in the general combined-oriented CCR model using an interactive MOLP method. Journal of Computational and Applied Mathematics, 234, 1-9. Lovell, C. A. K., & Pastor, J. T., (1997). Target setting: an application to a bank branch network. European Journal of Operational Research, 98, 290-299. Manandhar, R., & Tang, J. C. S., (2002). The evaluation of bank branch performance using data envelopment analysis: a framework. Journal of High Technology Management Research, 13. 1-17. Oral, M., & Yolalan, R., (1990). An empirical study on measuring operating efficiency and profitability of bank branches. European Journal of Operational Research, 46, 282-294. Paradi, J. C., Vela, S. A., & Zhu, H., (2010). Adjusting for cultural differences, a new DEA model applied to a merged bank. Journal of Productivity Analysis, 33, 109-123. Paradi, J. C., & Zhu, H. (2013). A survey on bank branch efficiency and performance research with data envelopment analysis. Omega, 41, 61-79. Portela, A. S., & Thanassoulis, E., (2005). Profitability of a sample of Portuguese bank branches and its decomposition into technical and allocative components. European Journal of Operational Research, 162, 850-866. Portela, A. S., & Thanassoulis, E., (2010). Malmquist-type indices in the presence of negative data: an application to bank branches. Journal of Banking and Finance, 34, 1472-1483. Rho, S., & An, J., (2007). Evaluating the efficiency of a two-stage production process using data envelopment analysis. International Transactions in Operational Research, 14, 395-410. Sherman, H. D., & Gold, F., (1985). Bank branch operating efficiency: evaluation with data envelopment analysis. Journal of Banking and Finance, 9, 297-315. Sherman, H. D., & Rupert, T. J., (2006). Do bank mergers have hidden or foregone value? Realized and unrealized operating synergies in one bank merger. European Journal of Operational Research, 168, 253-268. Sherman, H. D., & Zhu, J., (2006). Benchmarking with quality-adjusted DEA (Q-DEA) to seek lower-cost high-quality service: evidence from a U.S. bank application. Annals of Operations Research, 145, 301-319. Shyu, J., & Chiang, T., (2012). Measuring the true managerial efficiency of bank branches in Taiwan: A three-stage DEA analysis. Expert Systems with Applications, 39, 114494-11502. Ševčovič, D., Hlická, M., & Brunovski, P., (2001). DEA analysis for a large structured bank branch network. Central European Journal of Operations Research, 9, 329-342. Sowlati, T., & Paradi, J., (2004). Establishing the ''practical frontier'' in data envelopment analysis. Omega, 32 (4), 261-271. Tone, K., (2001). A slack-based measure of efficiency in data envelopment analysis. European Journal of Operational Research Society, 130, 498-509. Wu, D., Yang, Z., & Liang, L., (2006a). Using DEA-neural network approach to evaluate branch efficiency of a large Canadian bank. Expert Systems with Applications, 31, 108-115. Wu, D., Yang, Z., & Liang, L., (2006b). Efficiency analysis of cross-region bank branches using fuzzy data envelopment analysis. Expert Applied Mathematics and Computations, 181, 271-281. Yang, C., & Liu, H. M., (2012). Managerial efficiency in Taiwan bank branches: A network DEA. Economic Modeling, 29, 450-461. Yang, Z., & Paradi, J. C., (2006). Cross firm bank branch benchmarking using "handi-capped" data envelopment analysis to adjust for corporate strategic effects. System Sciences, 2, 34b. Yang, C., Wong, B. Y. H., Xu, D. L., Liu, X. B., & Steuer, R. E., (2010). Integrated bank performance assessment and management planning using hybrid minimax reference point -DEA approach. European Journal of Operational Research, 207, 1506-1518.